Collaborating with one of my favourite models; what could be better?!? 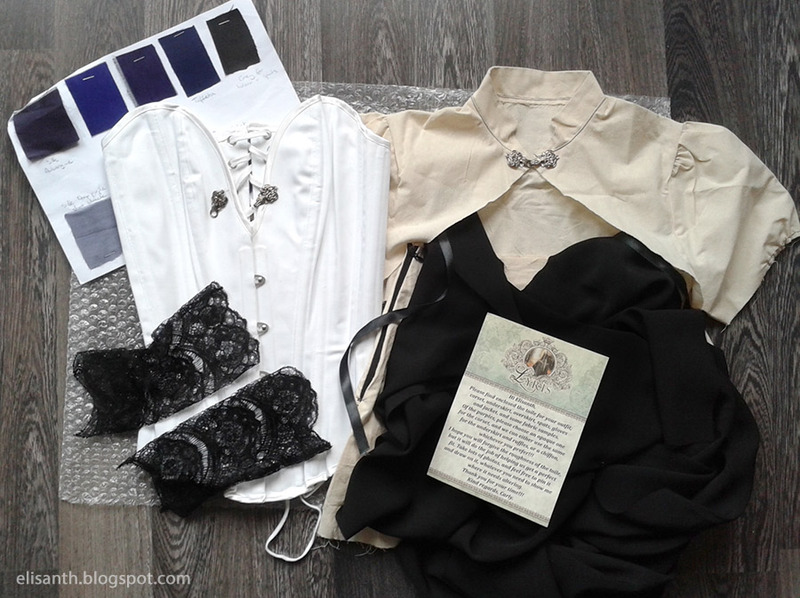 Last year I had the honour of creating an outfit for the lovely alternative model Elisanth. After chatting for a while over email to get an idea of Elisanth’s likes and dislikes, I drew up several sketches of possible designs. 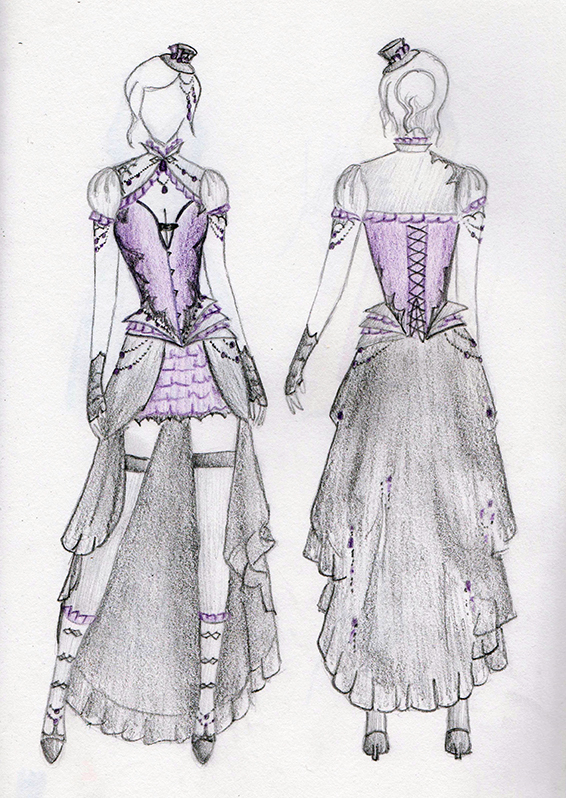 She wanted a Gothic Victorian look, with an overbust corset, and involving purple and black. The design sketch she fell in love with was this. Nothing too over the top; we really wanted to focus on a sleek, elegant look with lots of fine detail. You can see in this sketch, we were toying with the idea of either a single or double hip fin; in the end we chose the single hip fin. As always, once the design was finalised, the next step is pattern drafting and constructing a mock up of the outfit, also known as a toile. I quite enjoy pattern drafting; there is something quite satisfying about the math and the clean lines and curves 🙂 The toile is generally constructed from cotton, or coutil for a corset, and is used to check the fit before creating the final garments. Once the toile was complete, it was sent off to Elisanth in Moldova, and I waited impatiently to hear how it fit! Long distance fittings are usually a little more difficult, as you cannot be there in person to take the measurements and check the fit, but must instead rely on photos or Skype of your client trying on the toile. However, with this outfit, the toile showed that only very minor adjustments were needed in the pattern. The corset needed a little adjustment through the bust, the sleeves were made a touch shorter, the gloves were brought in at the wrist and the spats at the ankle, and that was it! Along with the toile, I always send a selection of fabric samples. 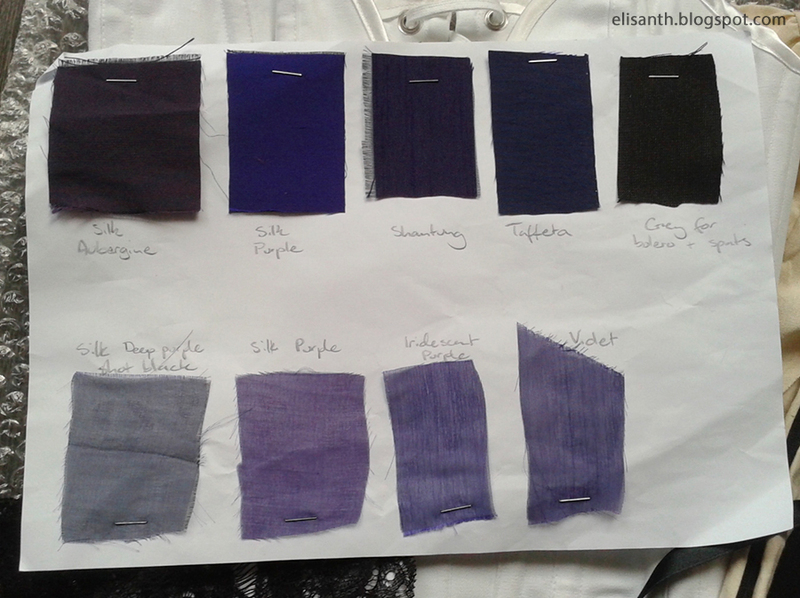 We had already decided on the colour scheme of black, purple and grey, so I sent a variety of suitable fabrics in these colours for Elisanth to inspect. 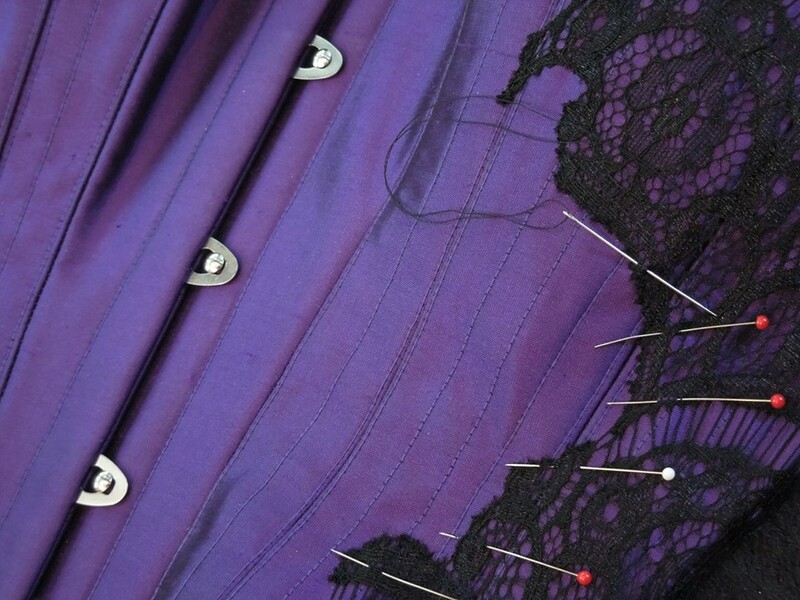 The final choice was a deep and vibrant violet silk for the corset, with matching chiffon for the ruffles, fine grey wool suiting for the bolero, spats and hip fins, black crepe for the overskirt and delicate black lace for the gloves and lace applique on the corset. Sadly, I got a little carried away and forgot to take many construction photos while working on this outfit. Here is one of the lace applique in progress on the corset. Lace applique is very time consuming, requiring as it does careful lace placement and many tiny invisible hand stitches, but it is one of my favourite methods of embellishment. 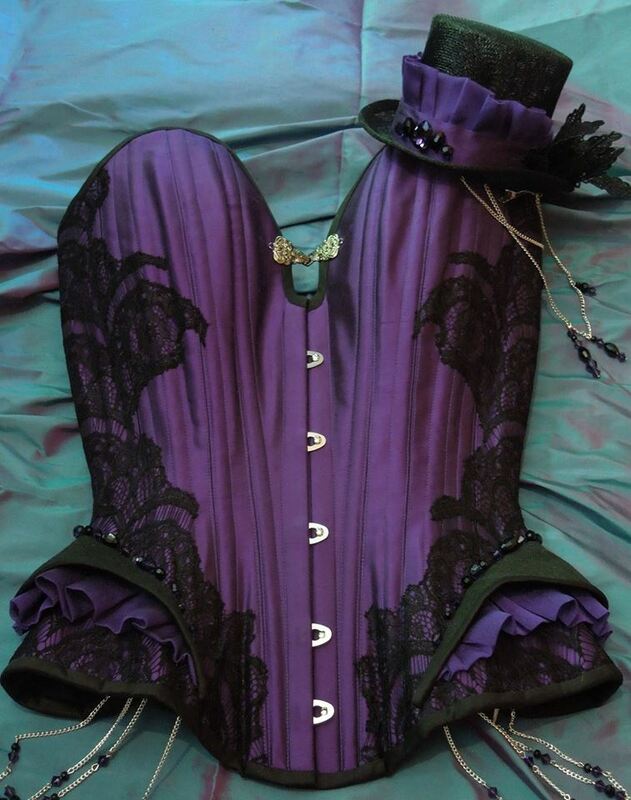 This corset was lovely to work on as the embellishments were elaborate but elegant. Purple chiffon ruffles peek out from under the grey hip fins, and deep purple and black Swarovski crystals were hand beaded along the line of the hip fin. The corset also had a lovely plunge neckline with an intricate silver clasp for a feature. These same clasps were also used at the neck of the bolero and on the spats. More Swarovski crystals and delicate silver chains were used to add features to the hips, the sleeves and neck of the bolero, and dripped from the gathers in the bustled black over skirt. To complete the ensemble, I made a black mini top hat with ruffles, lace, chains and crystals. 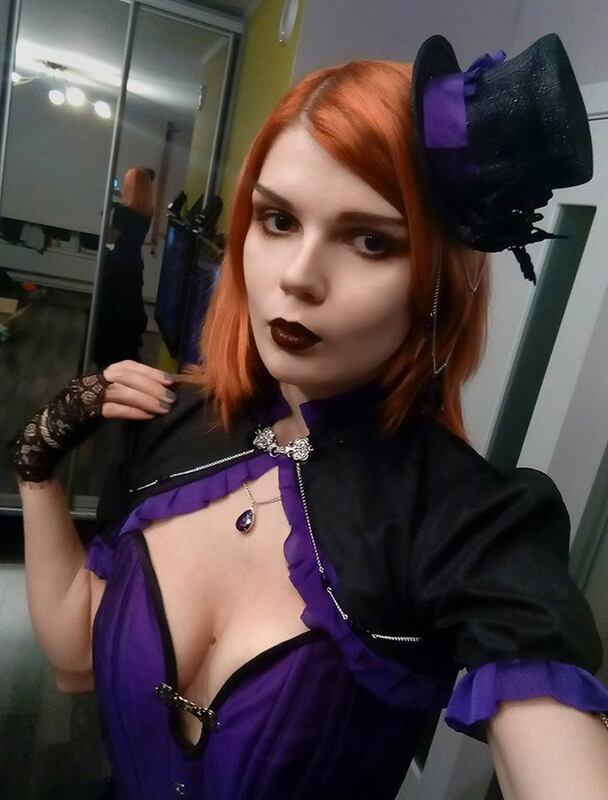 With the outfit finished and posted, I waited anxiously to hear that it was received safely and that Elisanth was happy with everything. Overseas clients are always that little bit more nerve wracking, whereas with local clients you have the instant gratification of being there at the final fitting to ensure everything is perfect 🙂 As always though, everything went smoothly, Elisanth loved it and it fit beautifully. Elisanth had very kindly agreed to do a photoshoot in the outfit, and she hunted carefully for the perfect location. 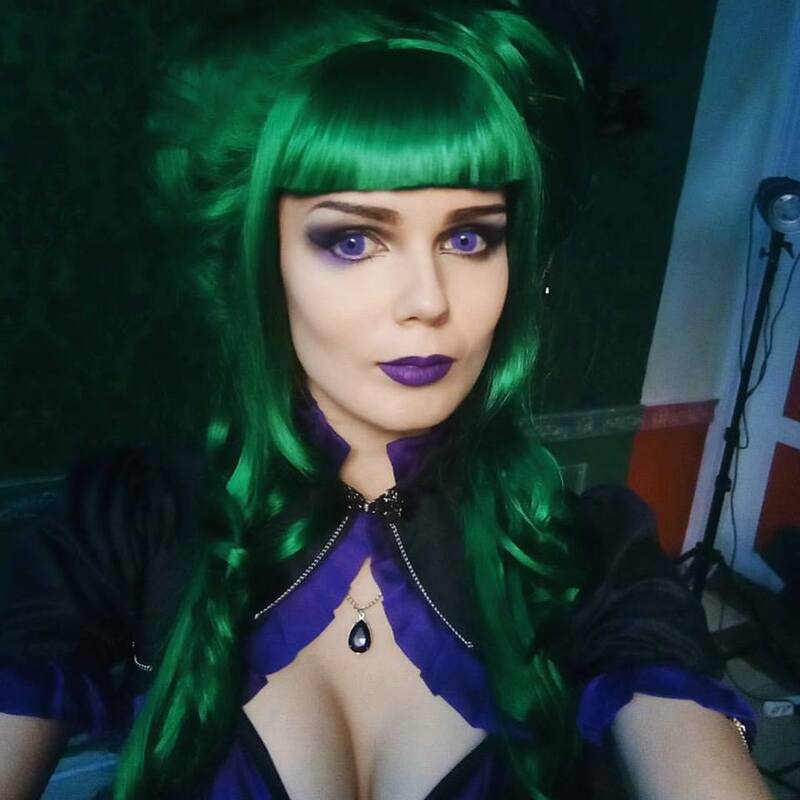 She also put a lot of thought into her hair and make up, ordering custom made purple contact lenses from Samhain Contact Lenses, and a custom wig from Pavy Creations. Here she is trying the outfit with her gorgeous red hair, a black wig and the Pavy Creations wig. Which look do you like best? This project was such a delight in every aspect. Elisanth is so very lovely to work with and an inspiration to design for, and the outfit itself was a dream to work on. I love my job so much!!! 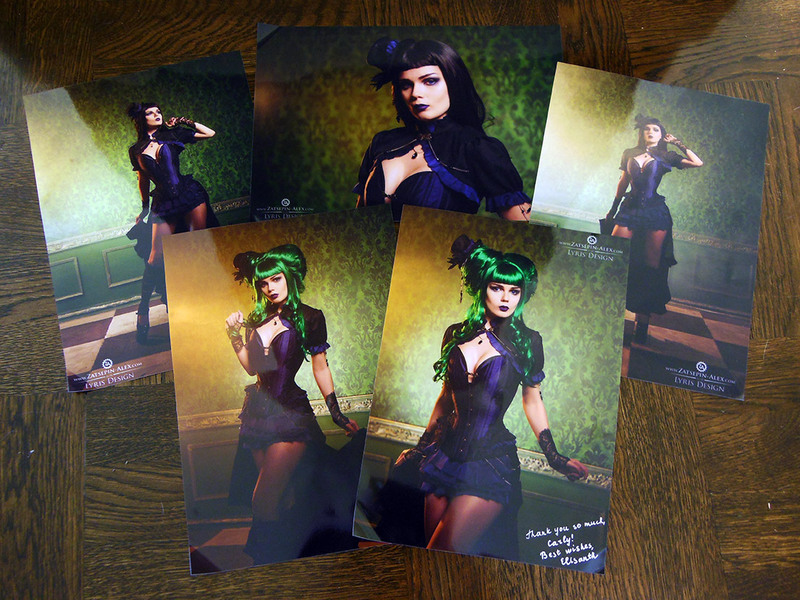 And to top it off, Elisanth sent me gorgeous signed prints of the photos, which was so very sweet of her!